Our guide to conquering the five realms. 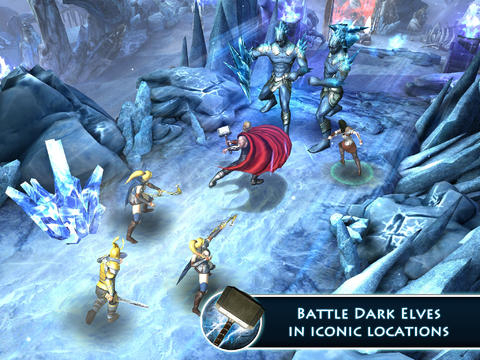 Although Thor: The Dark World certainly looks the part, with environments that should appeal to fans of the comic books and films, its limited gameplay and frustrating freemium set-up may leave you feeling a little deflated. Still, since it doesn't cost anything to try, you might as well take a look at the game for yourself if the idea takes your fancy. Stuck? Here are some tips to help you and your fellow Einherjar soldiers out. How do the levels work in Thor: The Dark World? You'll get to visit countless levels across five different realms - Vanaheim, Asgard, Jotunheim, Svartalfheim and Nidavellir. Each one comes with three objectives that reward you with stars, which you can use to power up Thor and unlock specific armor types - some of which originated in the comic books. 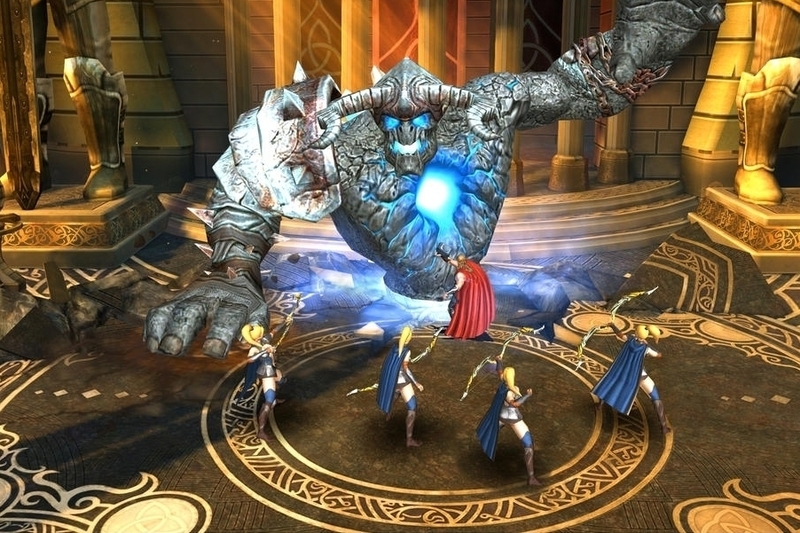 How does combat work in Thor: The Dark World? You'll control Thor through touch gestures. Tap anywhere on the screen to direct him around, and tap on an enemy repeatedly to attack it until it's finished. By holding down two fingers on the screen, you can also throw Thor's hammer, which is useful for destroying force-fields, or hitting long-distance opponents. 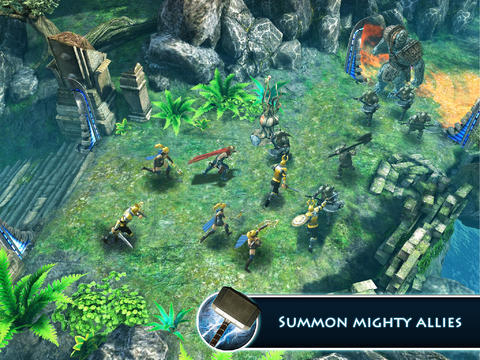 How do I summon allies in Thor: The Dark World? You can also summon allies and stronger Einherjar allies using the touchscreen, but this is dependent on your energy level and if you're waiting on a countdown. Both rebuild over time, so you should have no trouble consistently summoning help. How do allies work in Thor: The Dark World? Your general co-fighters - usually foot soldiers and archers - lack the strength to deal with tougher enemies, but they hold up pretty well against smaller opponents. Next up are the Einherjar soldiers, which have better armor and skills, and can be powered up over time using rune coins. You can find these by destroying items in the environment, and meeting particular goals in a stage. Finally, true allies unlock later in the game. These are the strongest friends that Thor can call upon, with even more increased abilities and strength. These take a little while to unlock, but they're certainly worth it. How do power-ups work in Thor: The Dark World? When it comes to Thor himself, you can boost four individual areas. First is his general Strength, which makes him faster and stronger each time you raise a level. Next up is Armor. These are new suits of armor that you can don once they're unlocked, either by collecting enough stars in the game or, if the option's available, buying right out. Then there are his Skills. Here, you can teach Thor new moves on the battlefield, including a collective hammer spin that can hit multiple enemies at once. We suggest going for this move first, as it's useful whenever you become surrounded. Finally, there's the Weapons section, best mainly around hammers. As you might guess, they get a bit bigger in size than the basic Mjolnir model Thor starts with, and even come empowered with flame, electricity and more over time. Shop around and see which ones work right for you. As for your allies, you'll basically increase their general Speed and Strength stats, which will serve you better in the long run during later levels of the game. 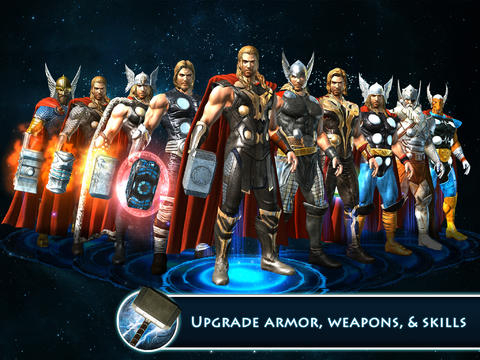 How can I play Thor: The Dark World without spending money? Sadly, there's really no way around the game's cash shop. When you start your game, you're given three general health potions, as well as a few mana potions. Eventually, you will run out, and you don't want Thor dying if you've made deep progress in a level. Once you do, you'll need to use Uru stones to buy new potions - and the game doesn't let you do it with in-game currency,. $1.00 should buy you enough to get a new health potion, but with some of the more difficult levels, you may need to purchase more. Otherwise, you can restart a level without paying money, but once Thor runs out of energy he's out of luck, since you can't restore it. Proceed with caution.